Your sinuses are located right behind your cheeks on top of your upper teeth. 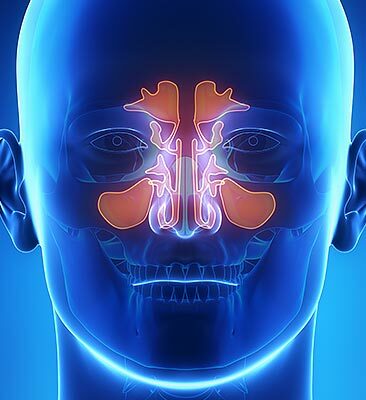 The sinuses are empty, air-filled spaces into which you breathe air through your nose. While you use your sinuses for breathing, they also happen to include some of the roots for your upper teeth, which extend up and into the upper maxillary sinus cavity. When you need to have any upper teeth replaced, specifically using Dental Implants, the bone in the sinuses may first need some augmentation before Dental Implants can be inserted into the mouth. This is due to the fact that there is just a thin wall of bone separating the maxillary sinus cavity and the mouth itself. When using Dental Implants to replace any extracted or missing teeth, the Dental Implants always require solid bone mass in order to securely hold them in place, thus ensuring the success of the procedure. The key to a successful Sinus Lift procedure is the quantity and the quality of the jawbone to which the Dental Implant will be attached. If your South Calgary Periodontist notices that bone loss has occurred either due to injury or periodontal disease, a Sinus Augmentation can be performed to raise the sinus floor and associated area for the formation of new bone. A Sinus Lift is one of the most common bone grafting procedures performed for those patients who have experienced bone loss, especially in the upper jaw. By growing more bone in the floor of the maxillary sinus, this will strengthen the bone in this location. This will then allow Dental Implants to be placed into the new bone growth. Also referred to as a ‘Sinus Augmentation’, a ‘Sinus Lift’ involves lifting up the sinuses to make room for bone tissues that will be developed through bone grafting. This bone grafting is used to add width and height to the jawbone in order to make it suitable for receiving a Dental Implant. It can also help change the position of the sinuses in cases when it restricts the insertion of the Dental Implant. Some patients have a lack of room available for the Dental Implant as the sinus cavity lies too close to the jaw bone. How Do I Know I Need a Sinus Lift? During your South Calgary Periodontal consultation, your periodontist will perform a thorough evaluation of your jaws to determine your suitability for Dental Implants. As part of this examination, they will use diagnostic imaging techniques to view the structures of the jaw and face. If this analysis reveals that the ideal Dental Implant site lays too close to the sinus cavities, your periodontist may recommend a Sinus Lift. This analysis can also identify the need for Bone Grafting, a procedure that replaces any tissue lost due to atrophy in the prolonged absence of tooth roots. Dental Implants offer the opportunity for improved quality of life! Your South Calgary Periodontist can assess your specific needs to see if you may be a suitable candidate for Dental Implants … and whether you may need a Sinus Lift as part of this process. Call us at (403) 278-5446 to book your Sinus Lift consultation appointment today!